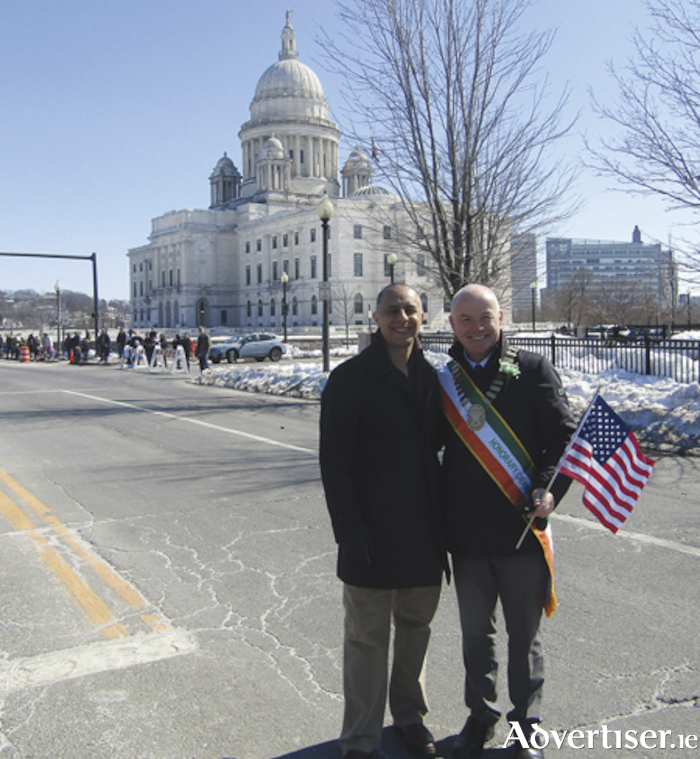 Mayor of Providence, Jorge Elorza and Town Mayor, Frankie Keena, prior to the Providence St. Patrick’s Day parade. Fresh from his recent visit to Providence, Rhode Island, Town Mayor, Cllr. Frankie Keena, spoke of his positive interaction with influential members of the local community which will hopefully benefit Athlone in future times. The Town Mayor was accompanied on his promotional trip by Martin Murray, Director of Services, Westmeath County Council. Also present were members of the Military Police Association of Ireland and Caoimhe O’Connell, Chairperson of the Athlone St. Patrick’s Day Committee. “Upon arrival we were greeted with approximately seven inches of snow as we met with Athlone native, Patrick Griffin, who has been residing in Providence for over 25 years. He is the present Chairman of the Providence Committee. Patrick and his committee colleagues gave us a very warm welcome to their beautiful city which was most appreciated. “We also carried out formal visits to the State House and City Hall where we met with both the Governor of Rhode Island and the Mayor of Providence and Johanne Ryan who is the Leader of the House presented us with a number of citations,” the Town Mayor remarked. Cllr. Keena was in situ for the Providence parade which took place in advance of the national feast day. “The parade took place on March 9 and it was simply a superb occasion. Prior to it commencing, I me with the US Senator from Rhode Island Sheldon Whitehouse. The excitement from participants and onlookers was amazing. I was delighted to be honorary Grand Marshal and to march for about four kilometres alongside the Mayor of Providence and Patrick Griffin to the reviewing stand at the State House. It was just great to witness people of all nationalities join with us and our Irish people living in Providence to embrace and celebrate our Irish culture,” Cllr. Keena continued. The Town Mayor noted that a formal partnership with the town of Athlone was a possibility in the future as interests in such a union gathered momentum. “One message which kept coming through over the couple of days and that was the level of interest from Providence to have a more formal partnership with Athlone. Since 2012, a large number of people from Athlone travel annually to Providence for their parade and only this weekend we enjoyed a large number of US visitors to Athlone for our parade. Apart from this increased footfall of tourists which notably boosts the Athlone economy, there is also some interest from people to develop a baseball team in Athlone under the umbrella of Baseball Ireland. It is fantastic to see this interest in Athlone coming from this major US city,” Cllr. Keena concluded.